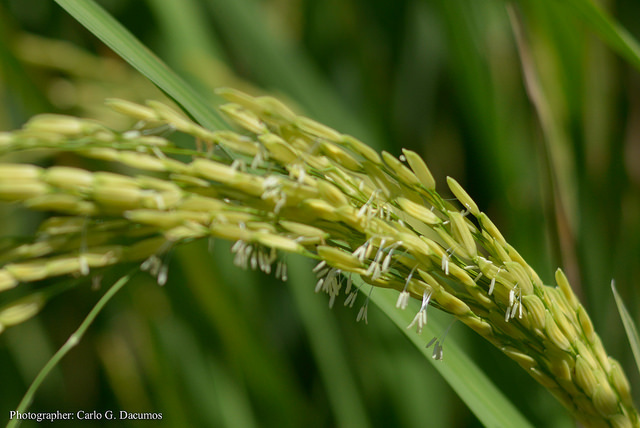 The National Seed Industry Council (NSIC) approved 14 new inbred and dry-seeded varieties in 2015 developed by the Philippine Rice Research Institute (PhilRice), International Rice Research Institute (IRRI) and University of the Philippines Los Baños (UPLB). Among the newly-released varieties, four inbreds (NSIC Rc394, Rc396, Rc402, and Rc414) and five dry- seeded (NSIC Rc416, Rc422, Rc424, Rc426, and Rc430) were developed by PhilRice. NSIC Rc394 (Tubigan 32) is an early-maturing variety (106 days) and has an average yield of 5.2 t/ha across season. NSIC Rc396 (Tubigan 33) and NSIC Rc402 (Tubigan 36) have average yields of 5.1 t/ha and 5.5 t/ha, with 106 and 107 days of maturity. According to Dr. Norvie Manigbas, head of the Plant Breeding and Biotechnology Division, breeding these early-maturing varieties is one of the strategies in climate change mitigation. “The earlier the varieties mature, the earlier they are ready to be harvested. Our farmers can harvest and thresh the crop before strong typhoons or heavy drought come,” Manigbas said. NSIC Rc414 or Japonica 4, another inbred variety and a special purpose rice, has an average yield of 3.7t/ha across season and matures at 119 days. It has better resistance to common insect pests and has a high percentage acceptability of 83.3%. The dry-seeded varieties in rainfed ecosystems namely NSIC Rc416 (Sahod Ulan 13), Rc422 (Sahod Ulan 16), Rc424 (Sahod Ulan 17), Rc426 (Sahod Ulan 18), and Rc430 (Sahod Ulan 20) are intended for pest-prone environments. These dry-seeded varieties have higher resistance to common rice pests and diseases such as bacterial leaf blight, blast, green leafhopper, and white and yellow stemborer. Moreover, they have high acceptability percentages ranging from 81.7% to 96.7% in terms of general consumer preference on grain and eating quality when cooked. Other varieties approved by NSIC were developed by UPLB (NSIC Rc398 and NSIC Rc418) and IRRI (NSIC Rc400, NSIC Rc420 and NSIC Rc428).